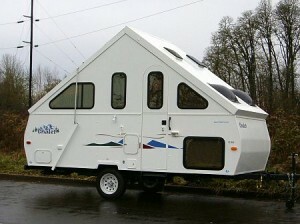 The XL series is Chalet’s largest set of a-frame pop up campers. The current lineup includes four different floor plans: the XL 1920, XL 1930, XL 1935 and XL 1935S. Other floor plans have been offered in the past, including the innovative XL 1938, which included a rare “dry bathroom,” in contrast to the wet baths typically found in pop up campers. All four current models in the XL series offer the same set of standard features and optional equipment, with one notable exception. The XL 1935 comes with a standard hard-sided expanding front dormer, while that feature is optional equipment for the other four. Other than that, the main differences between the four models are related to their floor plans. The XL 1920 is billed as Chalet’s best family friendly a-frame camper since it comes with standard bunk beds in its floor plan. The bunks can be used for sleeping or for storage, so this is also a good option for campers who think they may need the additional sleeping face for future children, guests, storage, pets, or anything else. Instead of bunk beds, the XL 1930 comes with a permanent, full-sized queen bed for ultimate comfort at bed time. Unlike smaller pop ups that force you to repurpose spaces as the day goes on, the XL 1930 features a dedicated place to sleep, to eat, to sit, prepare food,etc. It also offers an optional wet bath that is located centrally in order to provide a full 8′ of headroom. The main difference between the XL 1935 and the XL 1930 is that it includes a standard front dormer. In a-frame pop ups, dormers are a great way to bring extra light into the rig while also adding head space. In this case, the dormer is located over the front dinette, offering you great viewing angles while you eat or relax at the dinette. 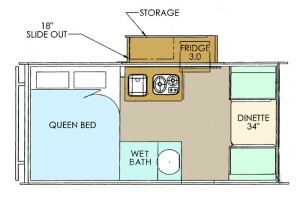 The XL 1935 also includes a permanent full-sized queen bed in the rear and an optional wet bath. The 1936S includes a standard galley slide-out, which provides a great deal of living space inside the rig that you just don’t get, even with much larger pop ups. It also includes a permanent queen bed, dinette and optional wet bath, and you can always add a front dormer as optional equipment as well. Aside from the standard front dormer in the XL 1935, all four XL series models come with the same standard features and offer the same optional equipment. One notable standard feature is Chalet’s patented electric lift system, which allows you to set up these rigs with zero effort or assistance. Although this system adds weight in comparison to a manual system, the XL series can still be towed by many crossovers, SUVs and minivans. The XL 1936S offers a slide-out, which provides additional interior living space. Image courtesy Chalet RV.